Ottomanson Glamour Collection is the perfect combination of fashion and functionality. 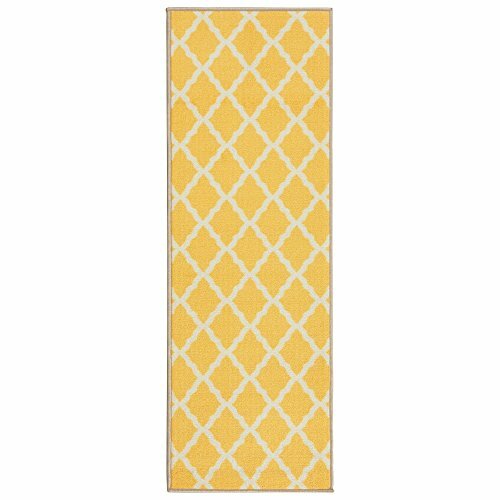 Boost up your spirit instantly and effortlessly when you roll out this stylish rug featuring an aesthetic lattice design with conspicuous cream-colored Moroccan Trellis motif on the vibrant yellow base composing a blend of traditional and fashionable flair. As an eye-catching piece, this high-quality yet budget-friendly rug will also create a focal point with simple yet classy geometric design in a charming ogee pattern. Stain and fade ressistant low-profile surface pile and hemmed edges offer a clean and tidy look, an easy upkeep and comfortable footing without bulks under your feet and under doors. This glamorous rug takes on the dual job of being visually appealing and combating kids, pets and high traffic areas to preserve your floors in the kitchen, by the kitchen sink, stove area, bathroom, living room, dining room, playroom, hallway, entryway, staircase, foyer, pets' feeding&litter area, kids room or any other room in your house or office. Its non-skid rubber backing assists with firm grip as you stand on it during your daily activities. Constructed with durable materials and naturally stain resistant high-quality nylon pile, these rugs will remain serviceable for long without requiring your effort even in spill-prone areas: just rotate periodically, vacuum and spot clean with mild detergent if necessary. From transitional to modern, child to adult, this versatile rug will appeal to the eye with colorful visual intrigue and will make a great gift for holidays, birthdays and baby showers. As a welcoming bold and bright splash of color on your floor, this rug gives off an elegant air and a classic feel with the fresh modern touch of chic conspicuous trellis pattern forming a focal point. | Rubber backing is designed to assure you, your kids and pets have a safe activity and footing on this rug by preventing slips and falls. With large scope of application, these lovely and budget-friendly mats also make great gifts for birthdays and holidays. | Low profile surface pile provides comfortable footing without any added bulk and promotes easy cleaning and vacuuming as well as easy fit under doors. Durable print rug is hemmed on all edges for a clean, neat and tidy look and longevitiy without fraying or shedding. | You can have peace of mind - Ottomanson earned customers' spurs and has been a trusted brand for unparalleled quality and style in the area rug category. Machine-made in Turkey with high quality nylon which is serviceable and naturally stain-resistant to give this rug comfort and functionality under your feet for long hours even in spaces where your house gets lots of traffic. If you have any questions about this product by Ottomanson, contact us by completing and submitting the form below. If you are looking for a specif part number, please include it with your message.